Mac and cheese is a classic comfort food and I love it during the winter. Creamy, with a crunchy breadcrumb topping and a nice crispy bottom/side crust of caramelized cheese. I typically hit it with some smoky bacon goodness, because, well, bacon. My general philosophy when it comes to mac and cheese and other comfort foods is that if you try to make them healthy, you’re basically removing the “comfort.” Eat smaller portions or less often, but don’t talk to me about non/low fat milk, cheese, etc. for this. Low-fat cheese, in particular, gets odd in melted applications. I like to serve this with a romaine salad for temperature and textural contrast, not to mention as a palate refresher. 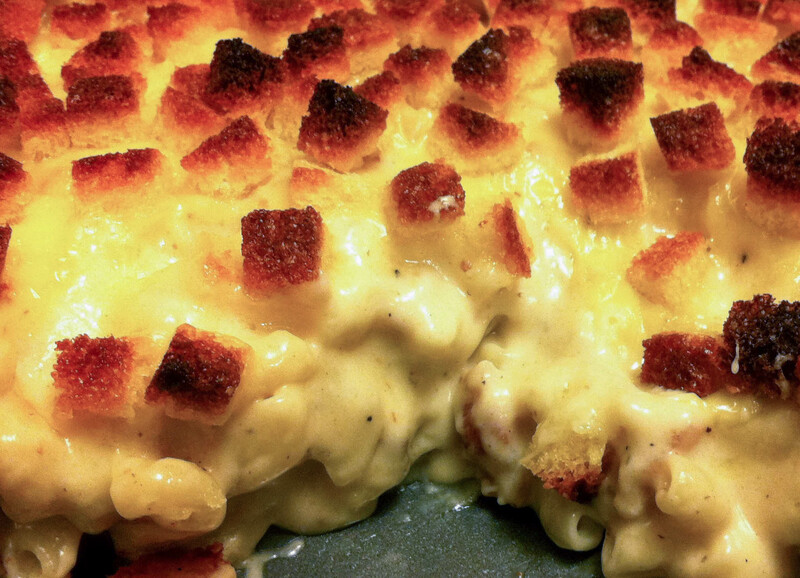 Notes: This is a half-recipe because a whole pan is, well, a lot of mac and cheese. Don’t ask how many calories are in this. The smokiness of the bacon is lovely in this. If omitting the bacon (why?!? ), replace the tablespoon of rendered bacon fat with a tablespoon of butter. Recommend freshly ground nutmeg and black pepper. Whole nutmeg and a Microplane Zester/Grater . Done. Same for the cheese – save yourself some money and buy your cheese in block form. Keep refrigerated right until you grate it for easy grating. A good box grater will make short work of this. I use the big holes. Fundamentally, the cheese sauce in a traditional mac and cheese is a béchamel, a white sauce prepared by adding milk to a light-colored roux. A roux is simply flour cooked in a fat. When combining the milk with the roux it is critical that the milk be as hot as possible without burning and that it be added in increasing amounts to ensure a smooth sauce – in small amounts at first and then in larger amounts. Serve with a crunchy green salad. Prepare the cheeses: Grate the cheeses and put in a large bowl. Toss to blend. Cook the macaroni: Put 2 quarts of water in a pot and bring to a rolling boil. Salt the water so that it tastes like the sea – about 1 tablespoon. Add the macaroni and cook until the pasta is slightly undercooked, about 3-4 minutes. Transfer to a colander, rinse with cold water to stop further cooking, and then drain. Prepare the topping: While waiting for the water to boil for the macaroni, trim and cut the bread into cubes. Melt 1 tablespoon of butter in the microwave in a medium bowl (1 minute on high). Put the bread cubes in the bowl and toss until evenly coated with butter. Make the cheese sauce: Put the milk in a covered medium saucepan over medium heat and bring almost to a boil. In the meantime, cook the bacon in a large skillet over medium heat until crispy. Transfer the bacon to a paper towel lined plate to drain. Pour off all but 1 tablespoon of the rendered bacon fat. Check the milk – it should be hot. If not, wait until it is nearly boiling. If boiling, turn down the heat to low so it does not burn. Return the skillet to the stove over medium heat and add 2 tablespoons unsalted butter. When the butter fully melts and is bubbling, add the flour and whisk for 1 minute to create a roux. Add the hot milk to the roux in increasing amounts while whisking constantly – first a tablespoon at a time, then a few tablespoons at a time, then 1/3 cup, etc. Each time you add milk, ensure it is fully whisked into the sauce so you don’t get lumps. Once you have added all the milk, continue to whisk until the sauce bubbles and becomes thick, about 8 minutes. Turn off the heat and whisk in the salt, nutmeg, cayenne, and black pepper. Chop the bacon into bits and add to the sauce. Add about 3/4 of the grated cheese and stir until the cheese has melted (I recommend a spatula). Add the cooked macaroni and stir until the pasta is evenly coated. Butter an 8” square baking pan (or other 1.5 quart baking dish) and transfer the macaroni mixture to the pan, using the spatula to smooth and work the mixture into the corners. Top with the remaining cheese and then the breadcrumbs. Bake until golden brown, about 30 minutes (good time to prep a salad), then cool on a wire rack for 5 minutes. Serve.